Royal Crown Derby Fine China Tea Set for Two in the "Carlton-Green" Pattern #1302, 5-Pieces, Circa 1987. 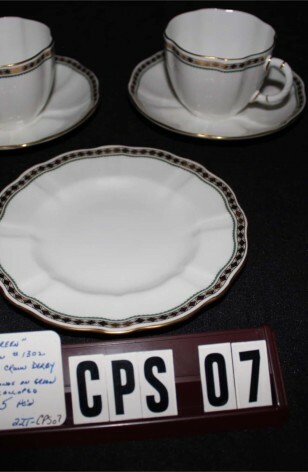 This is a Lovely White Scalloped and Fluted, Plates and Cups. Decorated with Green Band, filled by 22kt Gold Diamonds. Green Stripe is on the inside of the Band, on the Edges of Plates and Cups. 22kt Gold Rims, and on the Cup Handles. Very Good Resale Condition unless noted below or in pictures. 2 - Saucers - 5 5/8"